- Fancy Salwar suit Materials . - A set of 9 pieces. - Blossom Crepe top and bottom with chiffon Printed Dupatta. - Top with embroidery work.Sleeves of georgette. - An exclusive collection for upcoming ramzan season. - Semi Stitched Dress Materials. 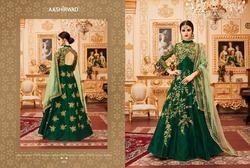 Designer Off-White Tapeta Silk Embroidery Suit. - Top : Bhagalpuri / Blue / 57 inch.